OneFi is on an expansion push after raising US$5 million in debt funding last month, and recently boosted its financial services offering with the acquisition of Nigerian payments startup Amplify. It has followed that up by rebranding Paylater as Carbon to reflects the company’s deliberate transition to a fully-fledged digital financial services platform that now offers bill payments, fund transfers and savings products, in addition to loans. The company’s mobile app being renamed, which introduces brand new products such as free credit reports and a wallet for its customers to perform discounted transactions. 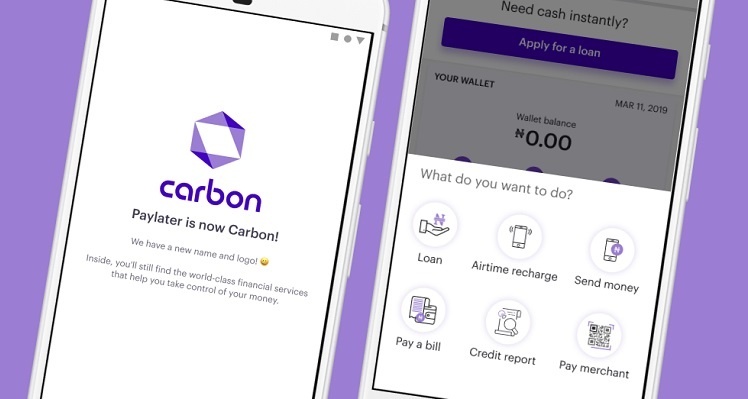 The transition is set to lay the foundations for Carbon’s focus on providing a wide portfolio of services for its customers, as it introduces in-app credit reports and provides credit via QR codes, in partnership with Visa. “It was very deliberate – most of our customers only know us as Paylater which conjures up images of credit, but we have grown as a company to offer so much more. Carbon is one of the most essential elements for human life, it is found in all life forms and is extremely versatile,” said OneFi co-founder and chief executive officer (CEO) Chijioke Dozie. The company is also looking to move into providing health insurance for its customers as it looks to lessen the burdens Nigerians currently face in accessing and paying for it. Carbon will also be launching their very own virtual Visa card for customers to handle transactions. “We’re in a competitive space but whoever serves the customer best will reap the rewards. That’s been the thinking behind our product evolution, whether it’s our Bloom account targeted at female entrepreneurs or the partnerships we’ve been working on in the healthcare sector. The focus is on being attentive to what our customers want and need,” said co-founder Ngozi Dozie.